Jake has been biting his paw and his back until it bleeds. 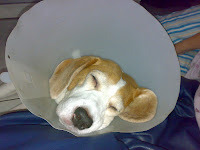 So now he has to wear a cone. 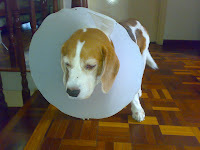 Lucky we can still con him into putting a cone. That way I went to put some old books at a CHARITY Box. Guess what I saw. 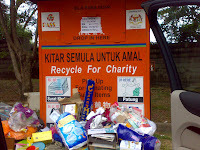 People treating it like rubbish dump. I dont understand why people must do this. There is a perfect rubbish bin about 100 meters away. they can just throw it there.